When I was 13 years old I got three gifts that I recall for Christmas. A thick dark blue sweater, a large package of underwear, and a Bible. The tradition in the Pullen household forty-eight years ago was to open gifts on Christmas Eve. After a special supper. Something we rarely got to eat because of the cost. Then my parents would drag it out as I, as the oldest, and my two sisters were antsy in anticipation of what gifts we were going to get. They were never extravagant — we weren’t those kind of people. My parents did the best they could. My mother stayed at home and took care of the house and us three children, and my father worked as a mailman. After supper, after everything had to be cleaned, washed and put away — and there was no automatic dishwasher. I washed the dishes and my sister next in age dried them. Then we all put them away where they belonged. My mother attended to cleaning up the stove and putting away any leftovers. Then, once enough time had passed according to my parents, we were permitted to begin opening gifts. We’d sort them out, each person handing something to someone else until all the gifts were near the person they were for. My parents would usually instruct us as to which one to save for last, as it was the special one they had picked out for us that particular year. And we always saved the one they said to open last to be the last. There was no TV blaring. No cell phones to constantly check the illuminated little screens of. Christmas carols played on an old console stereo. 33 and 1/3 rpm round sheets of black vinyl. Tennessee Ernie Ford, LP’S which contained various singing artists, Elvis Presley, Messiah by the Mormon Tabernacle Choir, Perry Como, Nat King Cole — of course, Andy Williams, and many compilation LP’S consisting of themes and various recording artists. After we opened our gifts, which usually consisted of between three to five wrapped boxes each year, and we had thanked our parents, and we had cleaned up all the wrapping paper, ribbons, and bows, we would spend some time with what we received while my mother prepared my favorite part of the night, which was to set out a wonderful munchies snack table. A really nice one. Again, with some foods we only got to eat on Christmas Eve. There was always a platter of really fine lunchmeats — when the quality was so much better than it is these days, and that isn’t just nostalgia talking — and all sorts of wonderful savory and sweet things to eat. We’d gather around the table when my mother announced everything was set — and she always made everything from scratch as far as deserts, or savory hot dishes on the table. No frozen, pre-made, heat ‘n serve, thaw ‘n serve, oh let’s pop it in the microwave gross and disgusting modern-day foods. No. Everything made by hand, in house — scratch made. My father would pray aloud once we were all seated, and we’d calmly and quietly begin to reach and gather and ask for the foods we wanted to eat. It was one night of the year when the family had wonderful conversation around the table and we laughed a lot. On December 25th, 1966, when I was 13 years old, the last gift I was handed and told to open last was a Bible. On the presentation page it read: Presented to Kenneth Pullen by Mother and Dad, Date 12-25-66. It was a compact yet hefty wonderful Bible. Published by Christian Herald Association, The Authorized King James Version — The Holy Bible containing the old and new testaments translated out of the original tongues and with the former translations diligently compared and revised. It contained sixty-four “Master Art” Illustrations. Wonderful Old World Master prints made from original paintings by some of the worlds most talented artists. Events not usually thought of, preached about, or spoken of in these times — events such as; The Creation of Light, by Martin — Noah Derided by Ham, by Lumi — Ester Entertains Ahasuerus, by Franck — The Cup Found in Benjamin’s Sack, by Bacchiacca — and on and on with a total of sixty-four wonderful master art illustrations. In 1966 as a thirteen-year old American kid I was spending most of my time listening to The Beatles “Revolver” album which was released in August of that year. And as much modern music as I could ingest. I was beginning to rebel. To be totally enamored of and drawn in by modern American culture. And at that time in history culture was literally exploding. I worked part-time babysitting the next door neighbor’s baby, I did that every single weekend as the next door neighbor’s were young — in their early 20’s for the wife, late 20’s for the husband — and a number of days throughout the week I walked to the nearby stables of another neighbor and cleaned horse stalls, re-strawed the stalls, feed the horses — they owned a number of horses themselves and also boarded over 20 horses — and I got paid .50 cents an hour to do this job. Got paid more per hour babysitting. So I had my own pocket money all the time as a young kid of 13. No allowance. My parents were truly taken aback and dumbfounded to hear of other kids actually being paid by their parents! I grew up very strict. My parents became very conservative fundamentalist believers when I was around six years old. We did not have a TV. No Christmas tree — because it was pagan [and it truly is pagan and has absolutely nothing to do with the birth, life, death, teachings, or resurrection of God come to earth in the form of man, Jesus the Lord and Saviour]. But I was rebelling. Big time. The times they were a changin’. War in Vietnam. Burgeoning of New Age thought and ideas going from the dormant seed stage to taking root and exploding in growth and influence. Loosening or mores and morals. The sexual revolution was in full bore mode. Young people were gathering, coming together in a theme, and doing something a lot different than recent young people had participated in. Violence increased. The cry was for peace and there was no peace [and there never will be and anyone who thinks there will be is totally delusional]. And when I unwrapped that Holy Bible as my last gift, my special gift — I totally forget what I had asked for that I thought I needed so much and wanted more than anything [within reason, we were not like the children of today who give no thought to economy or cost and only what they want no matter what] but when I unwrapped that Holy Bible my heart fell and I was sorely disappointed. We were already going to church 2 times a week. All day on Sunday’s and all evening long on Wednesday’s. Except for my mother’s immediate family relatives [none of whom belonged to the church my parents did, although my mothers mom did belong to the same church], and the neighbor’s next door, and people from my parents church we didn’t see or visit anyone else. And the people we visited the most were people from my parents church. All the time. So my heart dropped. I didn’t want a Bible! What was I going to do with a Bible! I was listening to the sounds of the revolution unfolding each day — The Beatles, The Rolling Stones, The Who, Jefferson Airplane, Frank Zappa and the Mothers of Invention, Bob Dylan, and Jimi Hendrix had just released his first single in the UK. I wasn’t interested in reading a Bible. I was already sitting through Bible class prior to Sunday morning services, and then we’d go upstairs and have the first Sunday service. Songs would be sung — no rock band. No organ. No piano. The congregation sang. Period. And a minister would get up and preach for at least 30 to 40 minutes, sometimes longer, and then after the minister preached in English more songs would be sung, and then a different minister would get up and preach in either Hungarian, or Serbian, or German. There were a lot of immigrants and folk’s from the Old World, Europe at my parents church. For the past few days I had my mind pricked regarding that Bible I received on December 25th, 1966, and what my father had inscribed on the first blank page. I didn’t know why that Bible was on my mind, but it was. It would come into my thoughts about 2, sometimes 3 times a day. I had no idea where it was. I knew I still possessed it, but did not know its whereabouts. I was checking one of the bookshelves late tonight — looking for a food / cookbook one of my instructors from when I was enrolled in culinary school has written. I wanted to make sure of the title and subject, as I am in the process of taking an online cooking course which she just happens to be teaching. And I looked to the stack of books I knew hers was in, and on top of the stack was a Bible. A Bible of my wife’s, which she never reads [a topic for an entire series of articles, but we will not venture there at this point] and seeing that Bible made me look to my left, where I know other Bibles are on the bookshelf. Bibles I had acquired over the years, long, long ago, but I no longer reference of use them because of their particular translations, which I no longer desire to read and do not believe to be good translations. And there, there right in the middle of the stack of about 5 Bibles I saw the old, beaten, tattered, covered in places with black electrical tape Bible my mother and father gave me that Christmas Eve 48 years ago. I therefore so run, not as uncertainly; so fight I, not as one that beateth the air: But I keep under my body and bring it into subjection: lest that by any means, when I have preached to others, I myself should be a castaway. And these God-breathed inerrant words struck my heart. I need, we all need to run the race to win, to obtain the incorruptible crown. But in so doing we must be temperate in all things, as an example. Not in following rules or living as a robot — to be holy because God and Jesus Christ are holy and we are to live and strive to be pleasing and acceptable unto Them, and if we desire to get closer to Them we cannot have any part of the world and its sin, because God our Father and Jesus Christ our Lord and Saviour can have no part of sin. Our sin repels Them. Our obedience and love and abiding by their instruction attracts. And if we do not bring ourselves into subjection, bring our bodies, our hearts, our minds under control and subjection to the ways and instruction of the Lord our God, and we tell others of God? And Jesus? And the way? Yet we do not abide by such and we are not in subjection? Then we are to be cast away. Period. Inerrant word of God. I also looked through that old Bible I received as my special gift on 12-25-66 and read some of the things I inscribed on the many blank front pages. About 99% of what is inscribed are Bible verses which struck me to the point of rewriting them in the front of this Bible by my own hand. The gift of that wonderful, now creased and torn and leather cover cracked Bible of 48 years ago is the greatest gift I could receive this night. I realize I have not been living the word. I have been lax. I have lived in error. I have not been living as I preach. I have not been living as I ought according the to inerrant word of God. There is no excuse and to make any only leads me to more ruin and being cast away! I need, as a great thirst of a man parched, I need the Living Water of the word of God! More and more, and to live it! Not merely read it! And I must allow the Spirit of God to dominate — DOMINATE — in the rightful role in my heart, in my mind, in my life. So I am not cast away, and I can live as the true salt of the earth, enhancing the true word of God, spreading its true purifying flavor! And that I must be a light unto the world, separate of and from this world, a peculiar person, a true disciple of Yeshua, Jesus the Lord, Messiah, and Saviour, so that those I come in contact with can see the light within me — and thus glorify the Father! It may have taken a while. But I finally got here. Both my parents are dead in the flesh, but thank you mom, and thank you dad. You knew the perfect gift I needed for my life, in order to truly have LIFE! I must now surrender and allow the Spirit of God to work in me to be how the Lord needs to form me, hone me, sharpen me, mold me, cast me, fire me, refine me — so that I am not, and cannot be confused as being of this world. Seeing that I live a life pleasing to God, so that I am not castaway, and so that I win the race and receive the incorruptible crown! 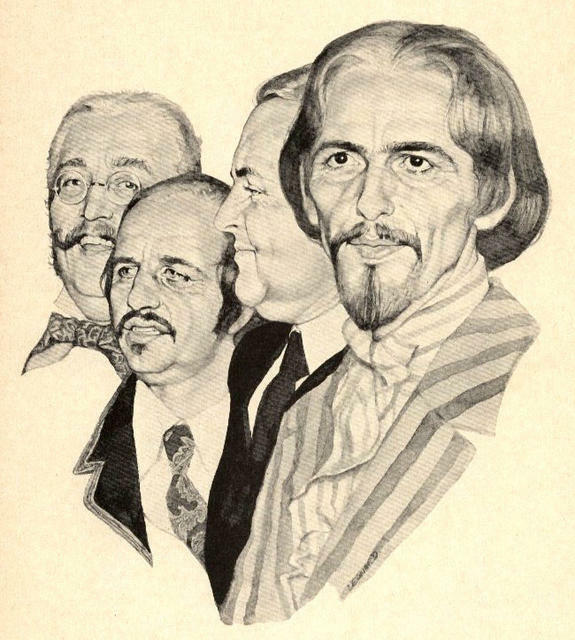 At the height of the Beatles’ youth and fame, an artist imagined what the Fab Four would look like “When [They’re] Sixty-Four.” Unfortunately only two of them made it to age 64, as George Harrison and John Lennon died at the ages of 58 and 40, respectively. The artist got it right, kind of. George Harrison looks like a conquistador and Paul McCartney is more trim in real life. John Lennon resembles a circus ringmaster while Ringo’s facial hair looks less than desirable. Poor Ringo, he’s had more than oneunfortunate moustache moment but he’s never attempted the absolute disaster that is known as the soul patch. H/T to Retronaut for the image. A picture of the beatles with the song helter skelter. This twangy jewel was the result of a remarkable exchange of influences between the Beatles and one of their favorite new bands, L.A.’s psychedelic folkies the Byrds. When guitarist Roger McGuinn saw Harrison playing a cherry-red Rickenbacker 360/12 guitar in A Hard Day’s Night, he recalled, “I took my acoustic [12-string] and five-string banjo down to the music store and traded them in for an electric 12-string.” Lennon and McCartney attended one of the Byrds’ first British shows in early 1965, and that August, on a day off from their U.S. tour, McCartney and Harrison attended a Byrds recording session in L.A.
Lennon described the song as the Beatles “doing our Tamla/Motown bit.” But at first, “Got to Get You Into My Life” was an acoustic number. An early take (available on Anthology 2) has McCartney singing in falsetto where the brass eventually shows up in the chorus. The horns were a remnant of the band’s idea to record Revolver in Memphis. They had long emulated the bass and drum sounds found on American soul records, so they recruited guitarist Steve Cropper of Booker T. and the MG’s to produce and dispatched Brian Epstein to scout potential recording locations. All the studios wanted an exorbitant fee to host the Beatles, so they ended up back at Abbey Road. “The Night Before” scene from the Beatles “Help!” movie. For any other band, a pop gem as magnificent as “The Night Before” would have turned into a career-making hit single, if not the foundation of a legend. But for the Beatles, it was just another great album track, slipping through the cracks as they sped from A Hard Day’s Night through Help! on their way to Rubber Soul. The band was writing and cutting masterpieces faster than fans could even absorb them. The band’s love of Motown was never more apparent, resulting in a hard-driving twist number that could have passed for prime Marvin Gaye at his most uptempo. In his double-tracked lead vocal, McCartney yowls about a lover’s betrayal, while Lennon plays a rollicking electric-piano riff. “That sound was one of the best [we] had got on record,” said McCartney. In the movie Help!, the Beatles perform the song on England’s Salisbury Plain, in the shadow of Stonehenge. Harrison mimes the terse, stabbing guitar solo — but it was McCartney who played it on the record. Brad Cole, Associate Director for Special Collections and Archives at Utah State University, shows me some of the school’s Wallace Berman Seminas. 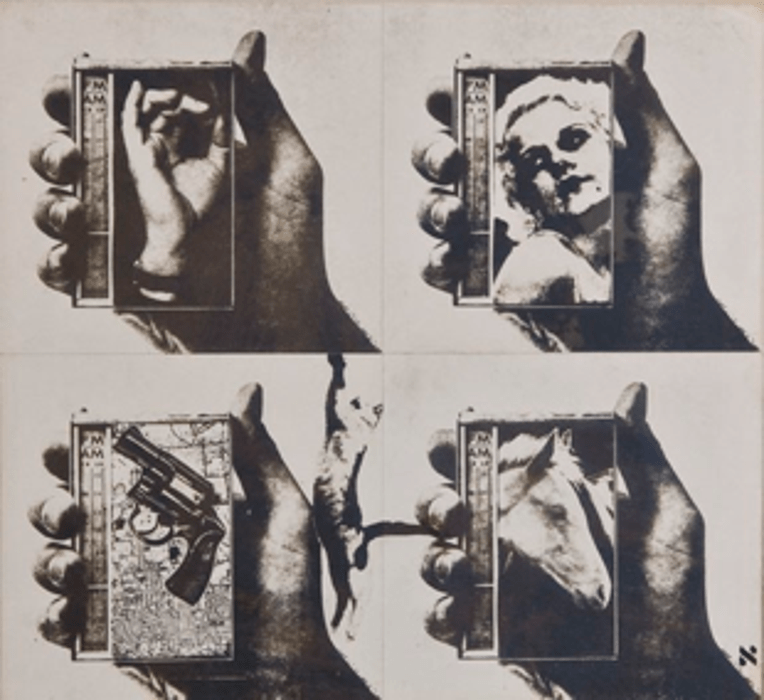 Wallace Berman (February 18, 1926 – February 18, 1976) was an American visual and assemblage artist. He has been called the “father” of assemblage art and a “crucial figure in the history of postwar California art”. Wallace Berman was born in Staten Island, New York in 1926. In the 1930s his family moved to Boyle Heights, Los Angeles. 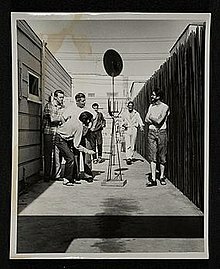 Berman was discharged from high school for gambling in the early 1940s and became involved in the West Coast jazz scene. Berman wrote a song with Jimmy Witherspoon. He attended classes at Jepson Art Institute and Chouinard Art Institute in the 1940s. For a few years from 1949 he worked in a factory finished furniture. It was at the factory where he began creating sculptures from wood scraps. This led to him becoming a full-time artist by the early 1950s, and an involvement in the Beat Movement. He moved from Los Angeles to San Francisco in late 1957 where he mostly focused on his magazine Semina, which consisted of poetry, photographs, texts, drawings and images assembled by Berman. In 1961 he came back to L.A., then moved to Topanga Canyon in 1965. He started creating his series of Verifax Collages in 1963 or 1964. Director Dennis Hopper, a collector of Berman’s work, gave Berman a small role in his 1968 film Easy Rider. He produced work until his sudden death in a car accident caused by a drunk driver, in 1976. Interestingly, Berman had said to his mother as a child he would die on his 50th birthday, and indeed he did die February 18, 1976…his fiftieth birthday. ref. Lost and Found California, Four decades of assemblage art, Corcoran, Wayne, Pence, 1988 pg.119. Semina 4, ca. 1959 . Wallace Berman papers, Archives of American Art, Smithsonian Institution. Berman has been called the “father” of assemblage art. He created “Verifax collages”, which consist of photocopies of images from magazines and newspapers, mounted onto a flat surface in a collage fashion, mixed with occasional solid areas of acrylic paint . Berman would use a Verifax photocopy machine (Kodak) to make copies of the images which he would often juxtapose in a grid format. Berman sought influence in not only those of his Beat circle, but in Surrealism and Dada as well as the Kabbalah. The influence of Kabbalah and Jewish mysticism is seen in his collages and other works such as his later inscriptions in-situ in Hebrew letters, and his only film, Aleph, a silent film that explores life, death, politics, and pop culture. His involvement with the jazz scene allowed him opportunities to work with jazz musicians, creating bebop album covers for Charlie Parker. Wallace Berman and other artists with 2 undercover Vice Squad officers, looking at Wally Hedrick‘s sculptureSunflower (1952), during the now-famous LAPD obscenity arrest at Ferus Gallery in 1957. In 1957 Wallace had his first exhibition of his artworks at the newly opened Ferus Gallery in Los Angeles. 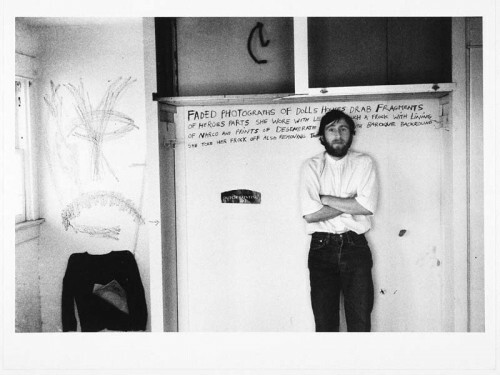 His friends were the curators/owners of the Gallery, Ed Kienholz andWalter Hopps. After the opening the L.A. vice squad got a telephone tip from an anonymous caller and during the raid they found what was deemed to be a pornographic image by Cameron Parsons entitled “Peyote Vision” at the bottom of one of Wallace’s assemblage works. He would later be convicted of displaying lewd & obscene materials. At the summation in the courtroom Wallace wrote on the blackboard “There is no justice, only revenge”  His actor friend Dean Stockwell would pay the $150.00 fine. That would be the last public gallery show for Wallace. His mail art publication, Semina, was a series of folio packages that were limited edition and sent or given to his friends. 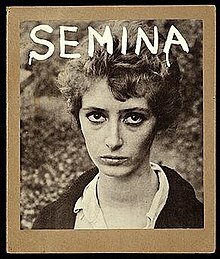 Semina consisted of collages mixed with poetry by writers Michael McClure, Philip Lamantia, David Meltzer, Charles Bukowski, William S. Burroughs, Allen Ginsberg, Jean Cocteau, John Kelly Reed and by Berman himself, which he published under the pseudonym Pantale Xantos. Semina was published from 1955 to 1964. 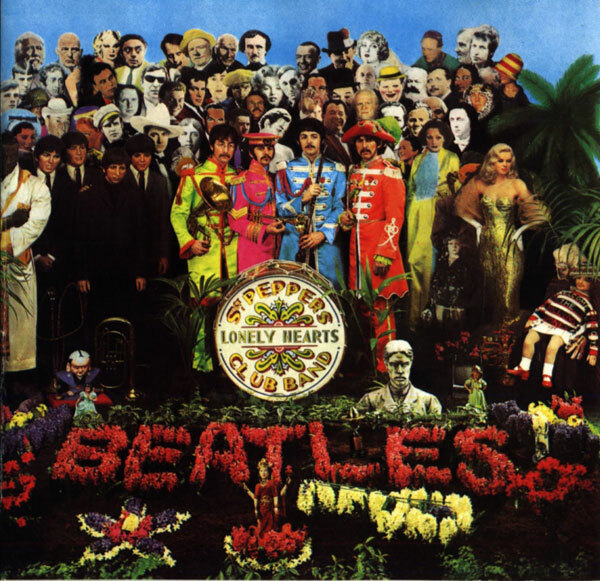 His likeness appears in the second row of the Beatles’ 1967 Sgt. Pepper’s Lonely Hearts Club Band album cover. The portrait is from a photograph taken by Dean Stockwell. It is directly above John Lennon, two rows up, next to Tony Curtis. In 1992 Berman’s papers were donated to the Archives of American Art by his son, Tosh Berman. Glicksman et al. Wallace Berman: Retrospective. Otis Art Institute Gallery, Los Angeles. Los Angeles: Fellows of Contemporary Art (1978). 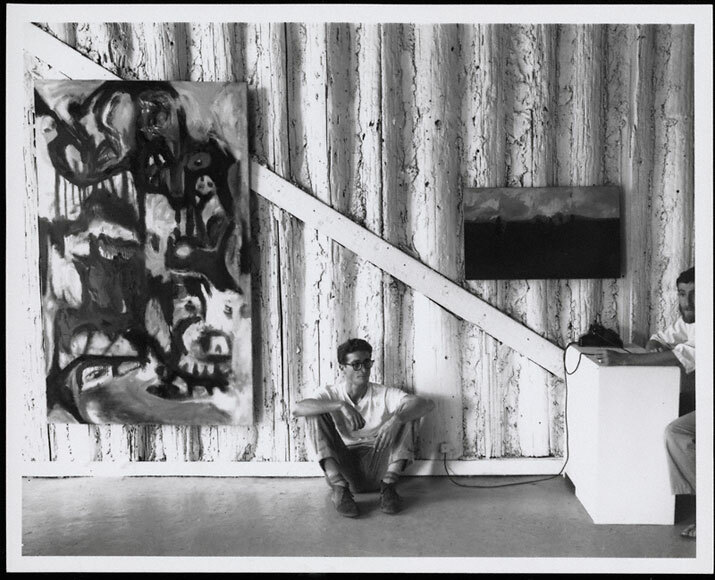 In 1957, Berman had his first gallery show at the Ferus Gallery in Los Angeles. After two weeks it was shut down for alleged obscenity, and the artist was arrested by the LAPD. In his subsequent career Berman avoided the formal confines of the art world. In 1955 he created a pioneering mail art publication called SEMINA, and in 1960 he opened the Semina Gallery on a houseboat near his home in Larkspur, California.